Accommodation: Hotel President booked on Hotels.com. Twin room for £234 for three nights. Back in December, my sister, Jen, and I were pondering what to get each other for Christmas and then had the brilliant idea of buying each other flights and going on a little adventure! Living in Scotland, we’re lucky to have Europe on our doorstep and are able to get lots of cheap flights across the continent. We decided to book flights to Budapest as neither of us had been before and we had heard good things. Although we live in Edinburgh, flights from Glasgow were much cheaper so we booked through Hungarian airline, Wizz Air. Wizz Air have a ‘Wizz Discount Club’ which I joined for £30 for a year. This gave us a discount on flights and luggage, working out as a small saving overall but we have the discount for the rest of the year if we happen to fly Wizz Air again. The airline only allows a small cabin bag (handbag/rucksack) per person so we had to pay to get a regular Ryanair/EasyJet sized carry on case. Altogether, flights were £90 each for Glasgow to Budapest. We landed in Budapest about 11am and after a little wander around the airport supermarket (we both enjoy a foreign supermarket! ), went to the bus ticket counter. We got the 200a airport bus to the start of the metro line and then the metro for 11 stops (about 40 minutes in total). The metro carriages looked really old but were clean and efficient. Budapest is split into Buda and Pest on each side of the River Danube and we were booked into Hotel President on the Buda side. At £225 for a twin room for three nights for a 4* hotel complete with breakfast, spa and helipad (sure to come in handy), we thought Hotel President was a bit of a bargain. Based on this we hoped to find Hungary quite cheap but prices were pretty similar to the UK (maybe because of how rubbish GBP is just now). The hotel wasn’t as swanky as we had expected (expectations entirely based on the helipad!) but it was nice and in a great location, allowing us to walk most places. After faffing about at the hotel, we used the ‘near me now’ function on TripAdvisor searching for ‘cocktails’ and found we were quite close to two highly rated cocktails bars. We jumped into our Budapest map (aka Google maps) and headed towards one. Tuk Tuk is quite small bar with nice décor and a friendly mixologist called Gergo. We ordered the first round off the menu and then told Gergo what kind of cocktails we liked and he mixed something for us. One thing we did find a little cheaper in Budapest was cocktails which were a few pounds cheaper than what you would pay in Edinburgh. After a few cocktails, we went on search of food. We had spotted a Mexican place a few streets away called Gringos Amigos, which was quite highly rated on trusty TripAdvisor so went there for some nachos and quesadillas. On our wander back to the hotel we walked past a stall selling traditional Hungarian chimney cake (or kürtőskalács) so bought one to sample. It is dough spiralled around a tube and then baked and rolled in toppings like sugar and chocolate. Pretty tasty and cheap for only 290 forints (about 80p). The next morning we had a Segway tour with Yellow Zebra booked for 9.30am. After breakfast at the hotel (pretty good) we walked to the company’s office which is just behind the Opera House. We were greeted by our guide Hunor and joined by an American woman, making a small group of three. The tours are two hours long plus an initial training session of about 30 minutes. We had never been on Segways before but we were pretty confident after a shaky start and soon decided it was a much better way to get around than walking! Our tour started at the Opera House and our guide pointed out the Millennium Underground station in front. In 1896, there were nationwide Millennium Celebrations in honour of the 1,000th anniversary of Hungary’s existence. The main celebrations took place in City Park and the Millennium Underground was created to take people from the centre of Budapest out to the Park. This was the very first metro line in continental Europe and the second in the world. We then went into the cycle lane on one of the main roads and headed to Erzsébet Square, where all three metro lines pass. Hunor pointed out Akvarium Klub, which is built under the pool on Erzsébet Square so kind of like an underwater nightclub. We Segwayed on to Vörösmarty Square, which is where a lot of shops are. The Square is named after the Hungarian poet Mihály Vörösmarty and his statue sits in the middle. Our guide told us that after World War 2, when a lot of women in Budapest had been widowed, people would meet in this Square to try to find new partners. Woman would sit in Gerbeaud Café and if they ordered a certain thing, it was a sign that they were looking to meet someone. A few minutes Segway from the Square, we found the River Danube and great views of all the bridges and Castle Hill. We jumped off our Segways and stood in front of the Vigadó Concert Hall. The Concert Hall has been rebuilt twice. Firstly after it was destroyed in the 1840s during the War of Independence and then after it was badly damaged during World War 2. Our Segways had been in training mode from the start of the tour and before we got back on them, Hunor (obviously deciding we were competent and trustworthy Segwayers) took training mode off so we could go faster. We followed the River Danube along to just before Chain Bridge and then headed slightly in land to the very impressive Hungarian Parliament Building. The Parliament of Hungary is the world’s third largest building and it is quite spectacular. 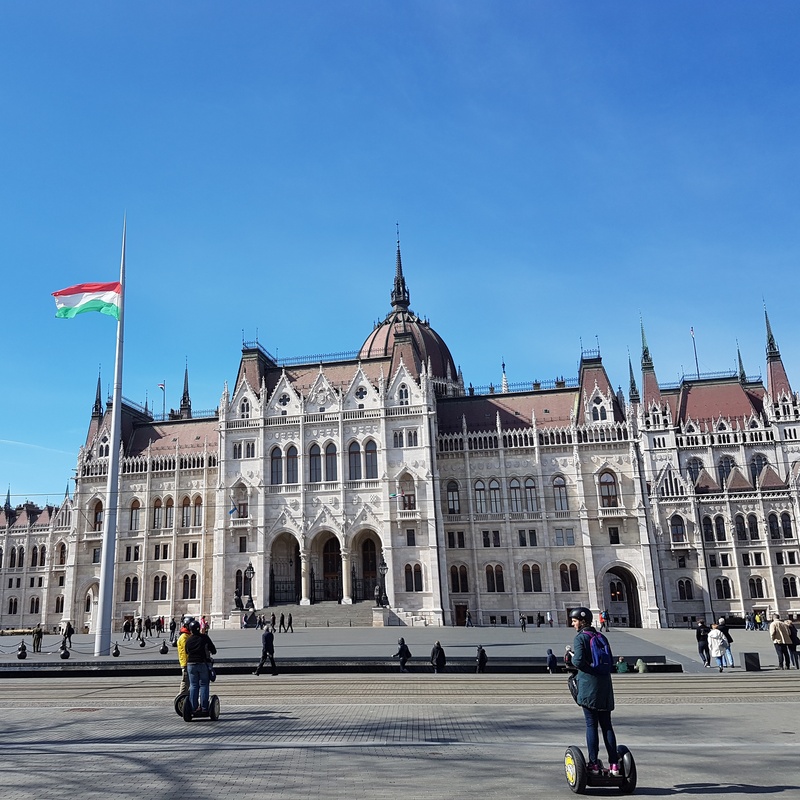 It stands in Kossuth Square, which provided us with lots of open space to see how fast our Segways could go! On a building across Kossuth Square from the Parliament, there is a memorial to those killed during the Hungarian Revolution, when the people of Hungary rebelled against Stalin’s rule. The Kossuth Square Massacre took place on 25 October 1956 where troops opened fire on about 10,000 nonviolent demonstrators. The bullet holes are preserved on the building as a monument to the 100+ people who were killed. Also by Kossuth Square is a statue of Imre Nagy standing on a bridge looking towards the Parliament. Nagy was Prime Minister of Hungary twice and his second term was during the Hungarian Revolution. This ended when his government (which was not supported by the Soviets) was brought down. Imre Nagy was tried and executed in 1958 but became a symbol of freedom and 200,000 people gathered for his funeral when he was reburied in 1989. Next on our tour was Szabadság tér (Freedom Square). There is a Soviet Army Memorial in the middle of Square, which is the last of its type in the city as all others have been moved to Memento Park. The monument honours the Red Army soldiers who died during the liberation of Hungary from the Nazis. As the Soviets then refused to leave, it is understandably unpopular with Hungarians. Apparently there is an agreement between Russia and Hungary that Budapest will keep the statue in place in exchange for Russia not destroying Hungarian war graves in Russia. There is also a statue of Ronald Reagan in Szabadság tér in honour of his help ending Communist rule. The last stop on our tour was Szent István tér (St Stephen’s Square), in front of St Stephen’s Basilica. St Stephen, the first king of Hungary, is the patron saint of the church. Strangely, his mummified right hand is kept in a glass case within the church. We headed back to Yellow Zebra headquarters and reluctantly left our Segways behind. I would highly recommend the Segway tour if you are visiting Budapest. It was fun way to get around and an informative tour. We had a wander (back on our boring feet) to find lunch and decided on Flour Style Wok Bar for some ramen, noodles and dumplings. After a tasty lunch, we got accosted by a man selling hop on/hop off bus tickets for City Sightseeing. They cost 7,000 HUF (about £19) each and covered two of the bus routes plus allowed you two boat trips, lasting for 48 hours. We were planning to go to the House of Terror next so decided to buy tickets and jump off there. In hindsight, these worked out to be a complete waste of money. We hardly used them and the boat trip was pretty rubbish. We jumped on a bus and sat doing a little loop – across the water to Buda, to the foot of Castle Hill, up to Citadel (at the top of Gellért Hill) and then back to Pest. We got off at the closest stop to the House of Terror. I find communist history really fascinating and had been really keen to visit the House of Terror Museum. A friend who had visited Budapest a month before us hadn’t been too impressed and there were some mixed reviews on TripAdvisor but we decided to give it a bash. We each bought the English audio guide so feel we gave it its best chance. I was hoping to come away from the House of Terror with greater knowledge of this period in history and an appreciation of the struggles of the people. However, if you asked me to sum up our visit in one word, it would be ‘confusing’. The museum was over a few floor with a number of rooms on each floor. As you entered each room, there was a number to type into your audio guide. I assumed that this would match up to what was going on in each room but it didn’t seem to. The first room had two rows of TV screens and also a projection on the wall of maps, showing the invasion of Hungary from various places. The audio guide seemed to loosely match what was happening on the maps, however, as everyone pressed play on the audio guide to start at various times, it didn’t really join up. And then there was loud music alongside the TV screens. The tour continued like this and we ended up wondering if there was something wrong with the audio guides. Confused and frustrated, we ended up rushing through the last sections of the museum as we felt that we were wasting our time. For the last part of the tour, you go in a very slow moving lift down to the basement, while watching a video. The basement has the rooms where people were held prisoner and tortured. The uses of some of the rooms were explained on the audio guide and it was quite an eerie place. As well as the audio guide numbers, each room had a printed sheet with information, which is an option if you don’t want to spend extra on the guide. Over all, a very disappointing visit. The building itself is very impressive and there has obviously been a lot of money spent on the museum and time gathering video footage. However, more thought needs to go into the explanation of the rooms and displays. We walked back to the hotel and used the spa area before getting ready for dinner. We are both big sushi fans and had seen an all you can eat sushi restaurant with a conveyor belt that we decided to try – Wasabi Running Sushi and Wok Restaurant. There are a few in Budapest and we visited the one at Podmaniczky utca 21. With the exception of our lovely Segway tour guide, Hunor, we hadn’t found people in Budapest to be particularly friendly, so we had quite low expectation of the service at the Wasabi restaurant. Despite our low expectations, we were absolutely blown away by how rude and unfriendly the staff were! The dinner all you can eat option cost 7,490 HUF (over £20) each, so not particularly cheap. The food was pretty average and we weren’t very impressed by a lot of the choices. For example, one of the dessert options was a piece of orange. It was quite a quiet night with only a couple of other tables in and we saw the same food going round the conveyor belt time and time again, so who knows how fresh it was. There were plenty of staff but no one came to offer us more drinks so I went up to the bar to ask one of the girls if we could order some. She was SO rude and seemed disgusted that I asked her a question, reluctantly taking my drink order. We paid for the bill (unfortunately service charge was included) and were ignored by all the staff as we left. We paid 21,500 HUF (about £60) for food, a cocktail each and 2 soft drinks and felt a bit robbed with the ok food and atrocious service. To summarise, I wouldn’t recommend visiting!